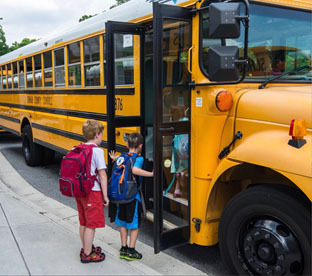 Each morning, the Transportation department of the Operations division sets the wheels of student success in motion by safely transporting over 50,000 bus riders to District schools and centers. Each afternoon, we return them safely home. We also proudly transport students and staff to and from extracurricular activities such as band and athletic events. Providing these services is both our responsibility and our privilege. We are committed to reliability, timeliness, and, above all else, safety. To that end, we have proactively designed and effectively implemented employee training and fleet maintenance strategies that have decreased preventable accidents, reduced bus break-downs, and increased on-time arrivals. We are honored to daily inspire, achieve, and excel on behalf of the children, families, and communities we serve.